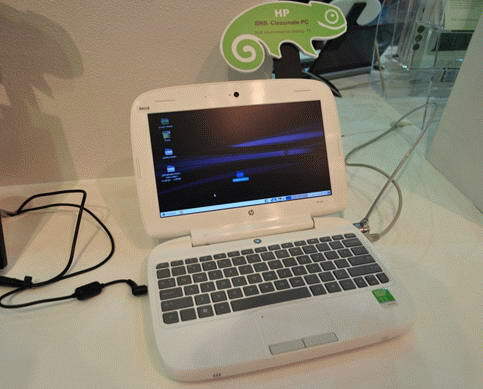 Hewlett Packard (HP) introduced its all new Classmate PC at the Computex 2010 exhibition.The all new HP Mini ‘Classmate PC’ is designed mainly for educational institutions.The notebook runs on SuSE Linux 11 OS. The all new HP Mini ‘Classmate PC’ comes equipped with a 10.1-inch display screen and is powered with a 1.66GHz Intel Atom (probably N45x) processor.The notebook includes a a handle on its back and made entirely of plastic. HP Mini Classmate PC notebook comes housed with 1GB DDR3 RAM 800MHz, a 160GB hard drive (5,400 rpm), Wi-Fi, 0.3MP camera, a Chiclet keyboard, and 3-cell battery for back-up power options. Tags:-10.1-inch notebook, Classmate PC, HP Mini Classmate PC Notebook featrues, HP Mini Classmate PC Notebook specifications, HP Mini Classmate PC Notebook details, HP Mini Classmate PC Notebook, HP, HP Mini, HP Mini Classmate PC, netbook.